A complicated weather setup will lead to a pair of rain chances and warmer temperatures through the middle of the week. Welcome back to work, school, and reality, New Jersey! It is one of the toughest Monday mornings of the year, following the big Thanksgiving holiday weekend. The weather will cooperate fairly well, although the big weather story of the week will be two batches of solid rain for Tuesday and Wednesday. You're waking up to clear skies and chilly temperatures on this Monday morning, as thermometers have plunged mostly into the 20s overnight. It's going to be a seasonable day - that means temperatures will be pretty typical for the last week of November. Highs should reach the lower 50s. Clouds will increase as the day goes on, especially after Monday late morning, but our weather should remain dry during the daytime hours. Clouds will continue to thicken Monday night, as a strong area of low pressure slides into the Great Lakes. Eventually, showers will encroach upon the western edge of New Jersey - models suggest first drops will fall sometime between 9 p.m. and 7 a.m.
A warm front will lift through New Jersey on Tuesday, dragging rain across the state throughout the day. As we tap into a river of rich atmospheric moisture, some steady to heavy rain could develop at times, and Tuesday could end up being pretty wet. Maybe even a washout, especially for the first half of the day. And I wouldn't rule out some thunder and lightning, given warming temperatures - highs on Tuesday afternoon will climb to around 60 degrees. It is important to note that throughout this week's active weather, temperatures will remain well above freezing, so we're only talking exclusively about wet weather and not wintry weather. Following a lull in the rainfall action Tuesday night through Wednesday morning (and possibly a break in the cloud cover), another round of rain is expected through Wednesday afternoon. 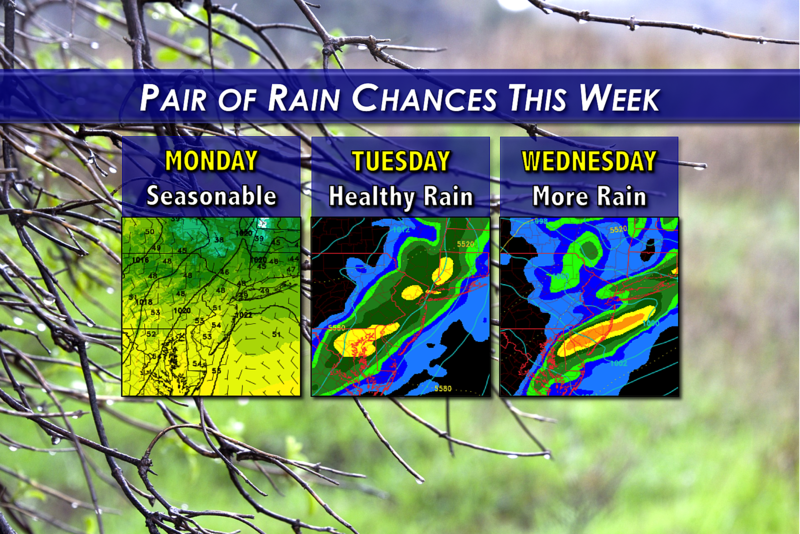 Again, some healthy rainfall is possible on Wednesday, especially through the second half of the day. Meanwhile, temperatures will be even warmer in the mid 60s - not quite a record, but still unseasonable for late November. When all is said and done, the rainfall from Tuesday to Wednesday should help our drought situation quite a bit. I believe everyone in New Jersey will see at least a half-inch of total rainfall. The wettest spots could pick up 2 to 3 inches of rain (or more) within 36 to 48 hours. 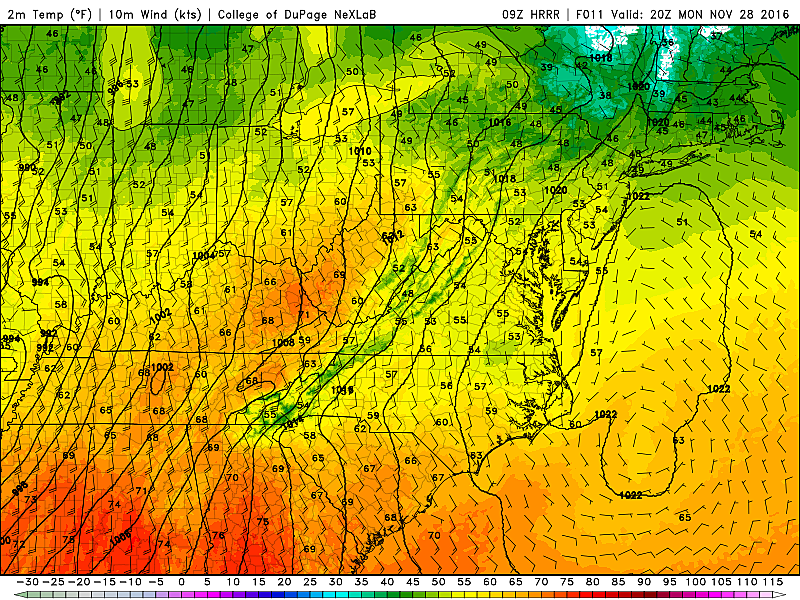 Wednesday's rain will be driven out by a final cold front, ushering in cooler and drier air for Thursday and beyond. Thursday afternoon's highs will be about 10 degrees warmer than Wednesday's, generally in the mid 50s. It will get even cooler for Friday and Saturday, with some highs limited to the upper 40s.